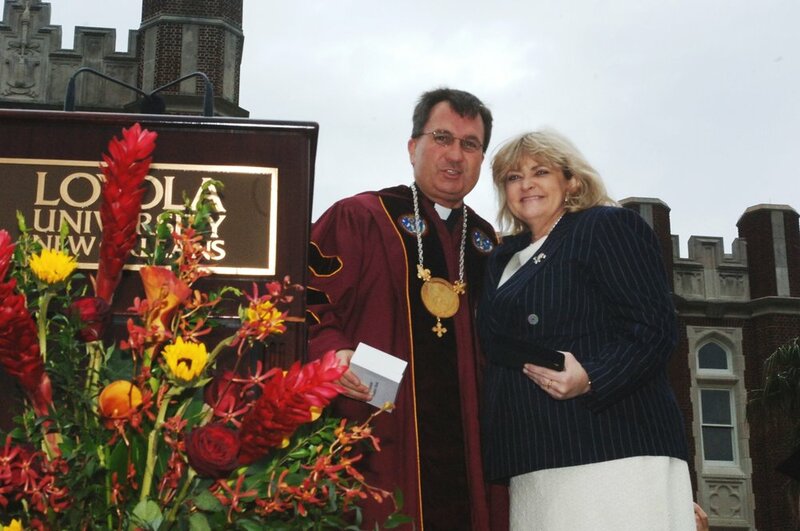 Cyndy Littlefield at Loyola University New Orleans with former president, Rev. Kevin Wm. Wildes, S.J. As we mourn the passing of Cyndy Littlefield, who served as vice president for federal relations at the Association of Jesuit Colleges and Universities (AJCU) for more than two decades, we are reminded time and again about the extent of her work on behalf of low-income students across the country. She was passionate about the important role that higher education plays in creating opportunities for all, regardless of one’s means. And she was always the first to stand up and speak forcefully about the many ways that Federal and campus-based financial aid programs have strengthened this nation. Cyndy was a proud alumna of Loyola University New Orleans. Among her many accomplishments as a student there were editing the student newspaper, The Maroon, and serving as the first female vice president of Loyola’s student government. Nearly three decades after graduating from Loyola, she was able to serve her alma mater in another significant way: after Hurricane Katrina struck New Orleans in 2005, Cyndy advocated successfully for Federal financial aid to support institutions of higher education that were most impacted by the disaster. To honor Cyndy’s dedication to her alma mater, as well as her advocacy for financial aid programs to help low-income students attend college, AJCU has partnered with Loyola to endow a need-based scholarship there in her name. We, as Cyndy’s colleagues, can’t imagine a better way to see that her commitment to helping students with financial need carries forward in perpetuity. We know that she would be most pleased to see this at the institution that helped her grow so that she could serve as she did. If you would like to make a contribution to the Cyndy Littlefield Memorial Scholarship, please click here: spark.loyno.edu/littlefield. Should you have any questions or prefer to send a payment by check, please contact Christopher Wiseman, Vice President for Institutional Advancement at Loyola: (504) 861-5499 or cwiseman@loyno.edu. Thank you for your support.